This Ifor Williams Trailer cover was made for Peter's business in Co. Fermanagh, in blue 610gsm heavy duty PVC. Peter's trailer's are used to transport goods and equipment so it is important that the cover protects the contents from the elements and also from theft. The unique shape selector system on our enquiry form helps ensure the correct dimensions are submitted so the cover will fit your trailer perfectly. Complete with re-inforced welded edges, eyelets to secure the cover with either individual bungee loops or a continuous length of bungee cord. This will create a perfect waterproof cover for your trailer. Made with 4 choices of tough material. Solid brass eyelets and bungee loops or cord fitted as standard. Available in red, blue, green, yellow, white, grey and black. All our trailer covers are custom made to order, so allow 2-3 weeks for manufacturing and delivery. We accept orders online or by phone. To order, submit an enquiry for a trailer cover by clicking the enquiry banner below. Do you want a trailer cover like this one? To see examples of other trailer covers we have made, visit our trailer cover gallery. We can make any type of trailer cover. 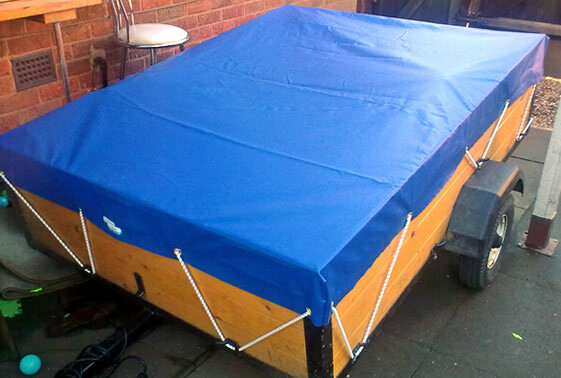 Using our website, Julie Russell was able to create her own made to measure trailer cover. Julie said "We have recently received a trailer cover from you, we would just like to say thank you and that it fits perfect. Thanks!" If you have a similar issue or indeed if this solution would work for you, just give us call on 028 7964 2638 or 004428 7964 2638 from outside the UK. 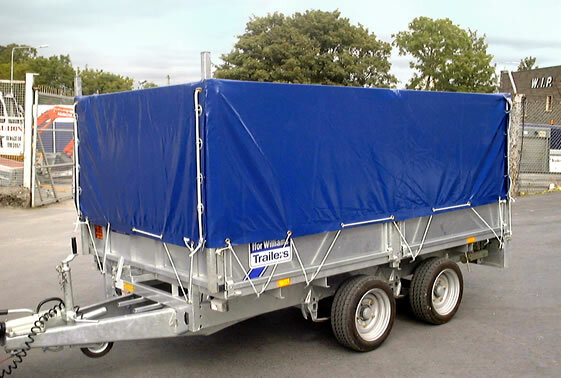 Or submit an enquiry for a trailer cover by clicking the enquiry banner below.